Textiles Blog: We did it! Our Webbing Inventory Image Galleries are Open and Ready! Yes indeed, we appreciate your patience. It took time to get our pictures lined up for all the 1-Way Straps. but at Rosemont Textiles we fabricate inexpensive one way industrial cargo webbing strap (also known as 1-way strap) for bundling, large-carton packaging, and other throw-away single use applications using polyester seatbelt webbing material. You are 100% welcome to call us now (1 610 520 9015) and we will gladly tell you about our inventory, pricing, and availability. Our clients love one way strapping made from automotive seatbelt because it is a versatile webbing that provides a great strength-to-cost ratio. You can use it to efficiently move and bundle materials during the production cycle. 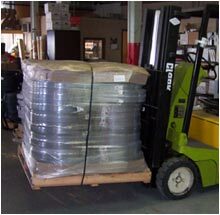 Our cargo strap solutions are cheap enough to send along with each shipment making it easier for your customers at the other end! 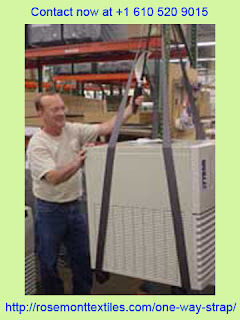 Take a peek at our lifting strap or sling on our image gallery pages, and you'll see how they are used to safely move valuable units in the factory (as well as to lower it into a protective shipping form for safe delivery). You don't even need to pull it out. Meaning, the strap travels with the product for easy removal by the purchasing customer!